At a time when aviation players are going through turbulent times, Coimbatore-based CMC (Coimbatore Marine College) group is venturing into the aviation industry by launching a low-cost carrier (LCC) under the brand Air Carnival. The company has stated that the airline's first flight would be ready for take off by the end of this month or early next month. To begin with, the airline will focus only the southern markets during the first one year. The airline would focus on short haul services and deploy ATR-72-500 aircraft for the same. The promoters are infusing around $12 million and plan to take three aircraft on lease. Manish Kumar Singh, chief executive officer, Air Carnival Pvt Ltd told Business Standard that the airline is expecting the Air Operator's Permit (AOP) in the next 6-7 days and it want to start operations by June end or first week of July, no later. Initially it is looking at Coimbatore-Chennai-Madurai sectors. The airline will start with one aircraft and two more will be added within the next two-and-a-half months. These 70-seater aircraft are more economical for short-haul services and they are proven one in India, said Singh. The airline will have daily service for 10 sectors including three daily flights between Chennai and Coimbatore and two daily flights between Chennai and Madurai. For the next one year the company would focus on the southern Indian market and later it would look at the north. The airline said around 25-30 per cent would be new routes, in which no other carrier is operating. For example, the airline is contemplating starting a service between Coimbatore and the temple town of Tirupati in Andhra Pradesh, and a service between Chennai and Mysore. 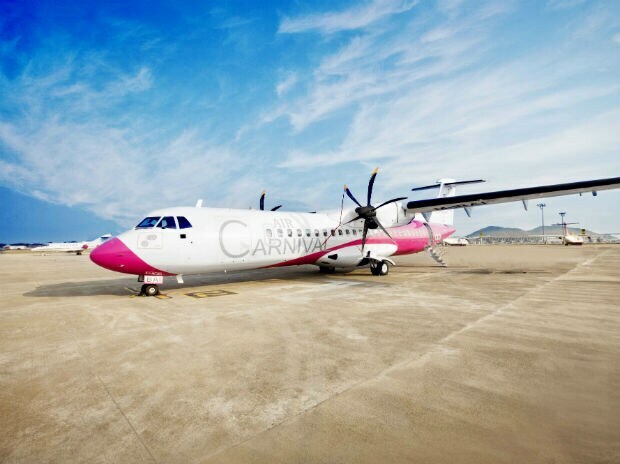 The promoter CMC group plan to infuse around $12-15 million (of which $5 million already invested) initially, to fund the acquisition of 3-5 aircrafts. "Once we stablise, we will look at raising money from investors," said Singh, who is confident that the airline will break even in two-and-a-half years. "This is the right time to start operations, since demand is high and fuel price has also dropped," said Singh. He said fuel cost used to be around 50 per cent of the total cost earlier, but has now come down to around 30-35 per cent. The Airline is targeting around 80-85 per cent load factor and target customers include first-time travellers, businessmen, leisure travellers and others. "One class cannot fetch business fully, so we need to tap all types of travellers to achieve the targeted load factor," said Singh. Air Carnival is the sister concern of CMC (Coimbatore Marine College) group of institutions established in 2002 in Coimbatore. S Irudaya Nathan, founder and director of CMC Group established Air Carnival Charter Services in New Delhi in the year 2013, offering charter services in India. The southern market is increasingly becoming hub for regional scheduled airlines. Religare Aviation had started one in the North, but it shut shop soon after opening due to poor demand. Of all the new airlines, Vistara is the only one not based in the south. AirAsia India, Pegasus, Fly Easy, Air Carnival, TurboMegha's TruJet, and Air Costa are all based in the south. This is because of the promise the region holds. Earlier, businessmen like Kalanathi Maran (promoter of Spicejet), Vijay Mallya (Kingfisher) and R Thiagaran (Paramount Airways), who were successful in their original ventures, could not extend their success due to various factors. Among the five regions -- North, West, East, North East and South -- the southern region is the most lucrative market considering it has three metros, which is half the total number of metros in the country. Hyderabad and Bangalore are greenfield and better planned airports, and this allows them to better support new airlines through improved infrastructure and sops. South has lucrative cities including Chennai, Bangalore, Hyderabad, Cochin and others. No other region is this attractive, says analysts.